Alex Hern runs through the latest negative economic news, and reports on the New York Times’s criticism of the UK government. There was more grim news on the state of the British economy today, with Ernst & Young’s ITEM club slashing its prediction for growth by 50 per cent today, meaning its current forecast stands at a mere 0.9 per cent for the whole year. It further recommends the Bank of England cut interest rates in half, from 0.5 to 0.25 per cent. “It’s worse than we thought. The bright spots in our forecast three months ago – business investment and exports – have dimmed to a flicker as uncertainty around Greece and the stability of the Eurozone increases. Although they avoid politicised language, Ernst & Young have joined a growing body of organisations speaking out against the well-worn “maxed out credit card” myth. 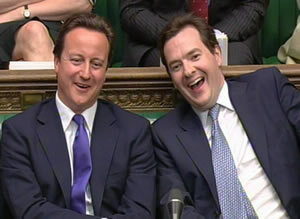 Drastic public spending cuts were the wrong deficit-reduction strategy for the weakened British economy a year ago. And they are the wrong strategy for the faltering American economy today. Britain’s unhappy experience is further evidence that radical reductions in federal spending will do little but stifle economic recovery. A few years of robust growth would go far toward making swollen federal deficits more manageable. But slashing government spending in an already stalled economy weakens anemic demand, leading to lost output and lost tax revenues. As revenues fall, deficit reduction requires longer, deeper spending cuts. Cut too far, too fast, and the result is not a balanced budget but a lost decade of no growth. That could now happen in Britain. And if the Republicans have their way, it could also happen here. Austerity is a political ideology masquerading as an economic policy. It rests on a myth, impervious to facts, that portrays all government spending as wasteful and harmful, and unnecessary to the recovery. The real world is a lot more complicated. America has no need to repeat Mr Cameron’s failed experiment. Cameron’s “failed experiment” leads to yet another economic down: http://t.co/S3Y6H9R5 reports @AlexHern #TheLostRecovery No surprise there. Referring to a “NYT” left wing agenda on a website called Left Foot Forward is funny. Selo, E&Y are quite clear that “there is scope for targeted tax relief and spending measures to help put us back on track.” The absence of this is due to the government’s austerity plan, a plan described as a “failed experiment” by the staid, centrist, and unbiased New York Times.